In Part 1, children began to learn about Italy through maps and a big atlas. First we ‘travelled’, then we learned fun facts (pretzels were invented in Italy, pasta was not). We learned that opera is from Italy, and children listened to and watched a symphony orchestra. 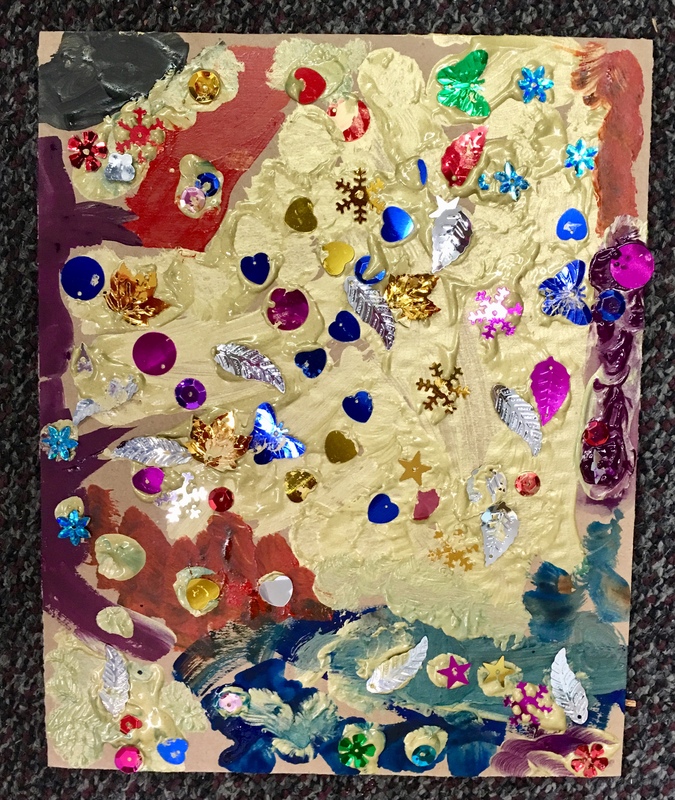 I showed children major pieces of art, and they recognized Starry Night, as that poster hangs in our classroom. In Part 2, I laid the foundation for creating our own art masterpieces, in preparation for our annual Art Show. We looked at important pieces of art once again, from The Scream, to Large Blue Horses, to Haystacks. The colorful art of Kandinsky struck a chord, so we read the book, The Noisy Paintbox. Kandinsky was moved to paint the sounds he heard, after going to the opera. Of course, we listened to an Italian opera, La bohéme. Ah, the combination of art and music is powerful. 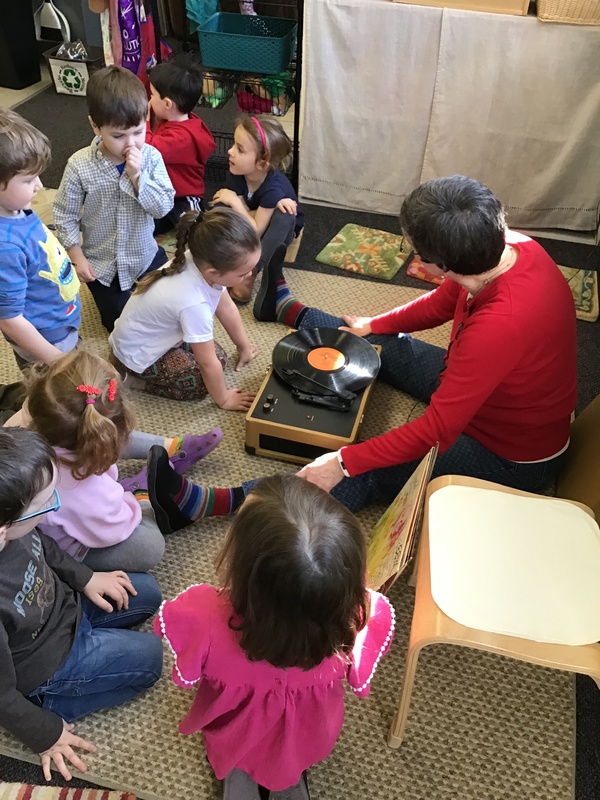 In order to properly introduce music, I needed the tools that would make music come alive for the children – a record player and record albums. Children were spellbound as I lifted the lid. I slowly touched and played with the turntable and the arm. Then I pulled out a record album and put it on the player. Children thought it was a giant CD. I turned it on, explained how the needle works, and rubbed my finger across the needle – what a surprising sound. 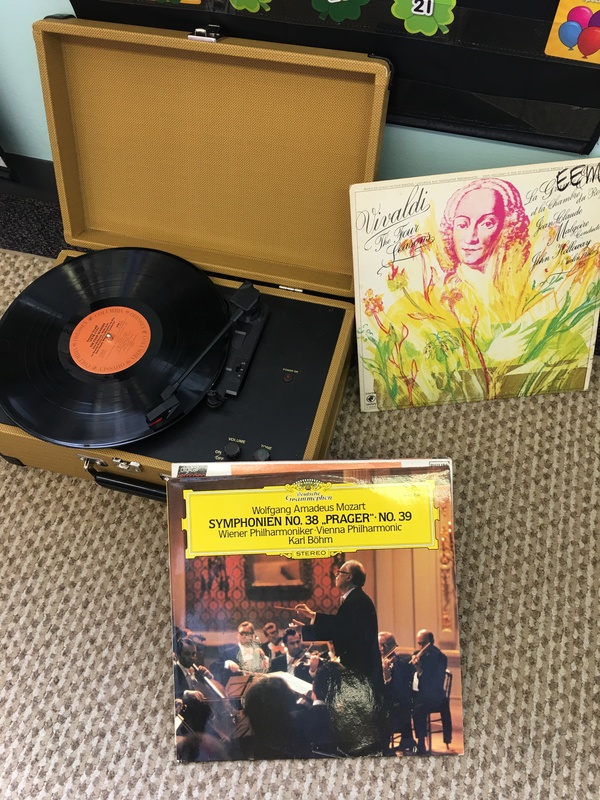 When the moment came to play the record, Vivaldi’s Four Seasons (Italian, of course), the music was a giant wave of wonder. The sounds poured out and filled the classroom. Kandinsky must have felt the same way when he went to the opera. Can you see me putting my hands over my heart and then shooting my arms and fingers out? And so, we were ready to paint, using real artist paints in tubes. We spent much of the week painting, often working on a piece over and over again. 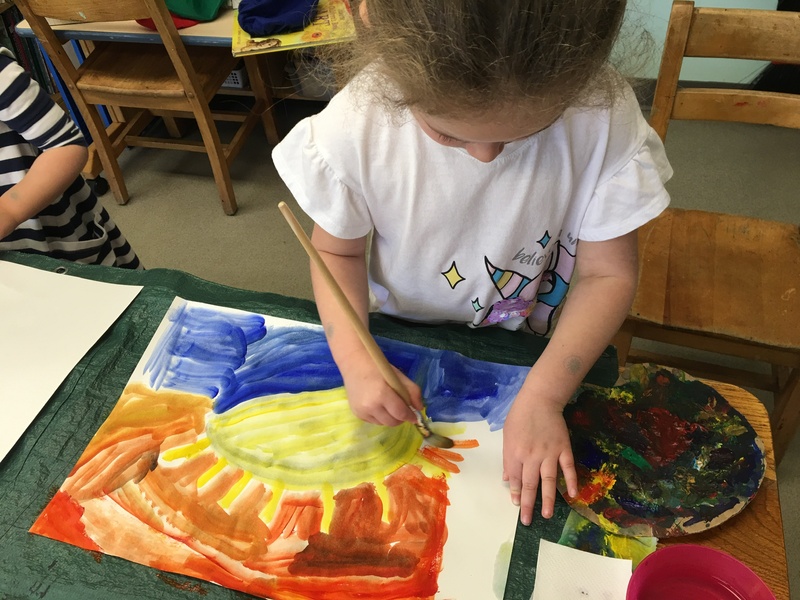 We painted like Kandinsky. Mia was moved by Monet’s Haystacks, and worked tirelessly on her own sunset and sky. We painted representational art (daffodils) and also Early Renaissance art. All the while, children listened to Vivaldi and to Beethoven as they painted. They felt the music and they created art that is worthy to be in an Art Show. I read a fabulous new book to the children, Because, by Mo Willems. As I opened the book, I saw that the end papers were the score to a Franz Schubert symphony. Wow! “What is that?”, asked the children. Of course they had no idea that this was reading music (invented in Italy) and each black dot represented a note, a specific sound. We talked about how the black dots are like letters that make words. Each page is what happens next, from people working to play an instrument, to forming an orchestra to play Schubert, to a little girl going to the concert, and much more. This is a wonderful book. We studied the Mona Lisa and wrote a story about her. It helped children to really look at art, beyond form and color. Art can have feelings, too. Did you know there is a curved road in the background that looks like a yellow S? I did not, but he children did. I’m so glad they equate happy eyes and mouth to a dog. Warms my heart. The most fun was learning to sing “Old MacDonald Had a Farm” – in Italian. The E-I-E-I-O is exactly the same, helping to make the song flow for children. We used Beanie Babies for the farm animals; a dog (cane), cat (gatto), cow (mucca), sheep (pecora), and a pig (maiale). Eddie said, “Jennie, we need a chicken.” He was right. Thank goodness I had a chicken (polo) Beanie Baby at home. Tomorrow we introduce Cubism and create art with shapes. We’ll explore The Three Musicians by Picasso, and find all the shapes. The first I Spy. We will also study The Snail, by Matisse. His grandson lives in my town. I taught his children many years ago. I mount and frame each child’s masterpiece, and then the big moment comes when each child gives their masterpiece a title. This will be as important as naming a new baby when s/he is born. Stay tuned for Part 4. This entry was posted in art, Book Review, books, children's books, Early Education, Expressing words and feelings, Imagination, Inspiration, music, picture books, preschool, The Arts, young children and tagged art, Beautiful by Mo Willems, Children creating art, Early Education, Franz Schubert, Imagination, Inspiration, Italy, Kandinsky, Mo Willems, Mona Lisa, music, record player, teaching young children. Bookmark the permalink. Jennie, this is fantastic and lovely! Here is the next part in Jennie’s excellent series! Thank you for reblogging, Charles! You’re doing a great job, Jennie. Thank you for your kind words, Anneli. Fun! Glad you had the wisdom and insight to introduce your young students to music on vinyl. You may have launched a budding STEM career! I think you may be right! The second day, there was no power coming into the player, and I discovered the wire was beginning to fray. I showed the children the tiny pieces of copper, and we talked about electricity. More STEM. Fortunately I was able to get a new plug later that day, so all was not lost. Learning opportunities conceal themselves in a variety of cloaks, including the perceived obstacle that becomes the path. I’m going to become a child once again so I can come and enjoy your class too! It sounds wonderful beyond belief. I wouldn’t be surprised at anything these children accomplish as adults because they have had such a fantastic and thoughtful teaching from you. Wow, great job and keep it up!!! This world needs more of you. Can you clone yourself? That is so true, Jennie. Thank heavens you and some others still feel the same way. It is so needed today. Amen and yes, yes, yes!!! I remember how magical they are from my young life. It is lovely to make artworks to exquisite music, Jennie. Brilliant idea and I am sure the children did love it and will remember it. Thank you, Robbie. The two together have remarkable power. Yes, I think they will love and remember it. Thank you so much, Ritu. If you have an old record player, I urge you to do this with your class. It pairs so well with art. I might bring in something different today, maybe the soundtrack to a The Sound of Music, or Oklahoma? Maybe one day, but I don’t think I have one! I’ll have to look! Yeah! 😀 A masterclass of art for your students & blogger friends! This is so inspiring and I imagine they feel as if they been to Italy! The children have lovely insight into their work and descriptions – I wonder where that yellow road leads! Finally, wow, you taught The grandson of Matisse!! That is amazing! I was stunned that they saw the yellow road! Children are a marvel. I taught the children of Matisse’s grandson, not the grandson. He is an artist, and his father (Matisse’s son) was an art dealer in New York. I sometimes wonder if those children I taught became artists. Thank you, Annika! Thank you, Geoff. I’m glad you enjoyed this. I will try to get a good close up of Mia’s sunset. My photo doesn’t do it justice. Stay tuned for more! I’d like to join your class, please! Now you should really freak them out and “play” the LP with your fingernail! You make the world sing for these children, Jennie, and keep the magic alive. I love it! Thank you, Noah! I so appreciate your wonderful words. Thank you, Lea! I remember your wonderful blog post about your visit there. And thank you for the link to the site. Wow! It’s so much fun reading this series, Jennie. I’m smiling as I try to imagine learning “Old MacDonald Had a Farm” in Italian. I’m glad you’re enjoying the series, Dan. Today is the last day of painting, then we frame and title all the artwork. It helps to stop and sing “Old Macdonald”. And we turned the main rug area into Venice with a rocking boat and swimming pool noodle oars. 😀 Ciao! Ha ha – I think the best part is letting them imagine. I just watched the storyteller video. Robert Lewis is definitely a man after my own heart, although my dad told a different story for how the stars came to be in the sky. According to him, the Tooth Fairy went around buying children’s lost teeth to set them in the sky as stars. My little boy loves our record player. His dad collects vinyl albums and Little O loves to pick one out to listen to. It is mostly punk though rather than opera. Jennie, you’re amazing. These kids are much more sophisticated at the art world then I’ll ever be. What a wonderful lesson in art and Life. They will be talking about you years from now and telling others how they learned to appreciate art, music and language. Nice job! Wow! Did you tell the kids? Boring me? No! Never! Ever! 😀 I wouldn’t be able to let it go… I’d have to do something the next few days. The railroad is packed with good stuff. How many kids have ever been on a steam engine railroad? Zero. Do you know the story in the early days of the post office railroad, of the father who mailed his child to visit her grandparents? Great story. See, I can go on and on. P.S. Love the Curly reference. I’m a member of that club! Can you do the classic Stooges hand move, snapping a finger on both hands, first on one and then on the other, and then slapping your hand on your fist? Doing it over and over, at lightning speed is classic Stooges. Thank you, Steve. It’s really the children’s books on art that are readily available. It gives me all the tools I need to teach. This has been such fun! I’ll have a final post that shows the children’s masterpieces. I hope this sticks with them, Sarah. Certainly they are excited and inspired and filled with many happy moments. Future artists would be a wonderful thing. Thank you!